Wildwood provides a comfortable and well-rounded outdoor experience with 5 cabins each housing approximately 18 campers and 3-4 staff members each with bunks, indoor bathrooms and showers. Campers are able to select a “buddy” to be placed in the same cabin during the registration process. The buddy needs to be of similar age and gender since the cabins are separated by gender and by age. Counselors live in the cabins with the campers throughout their stay. 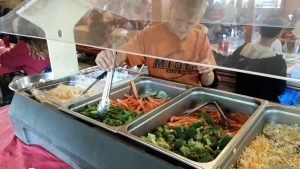 At Wildwood we strive to provide kid-friendly meals that are healthy for their active camp days. We use whole wheat breads, seasonal fruit and vegetables and lean proteins. 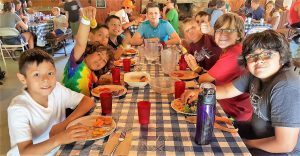 Campers eat most meals in the dining hall in a family style setting. For breakfast a hot meal is served and in addition there is a cereal bar, fruit, juices, milk and options. For lunch and dinner there is a hot meal and a salad bar with fresh veggies and fruit. Campers receive snack in the afternoon and evening. There is also fruit available all day in the dining hall. We do not allow campers to have food, snacks or candy in the cabins to protect the health of all participants. If you have any food that your camper will need, you may bring it to check-in and it will be kept in the kitchen. Picky eaters always find something to eat. We accommodate dietary needs, and we’re vigilant about food allergies.